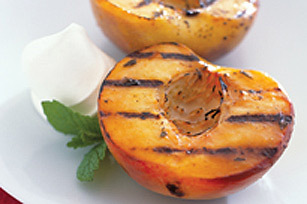 Grill dinner from start to finish with our Grilled to Perfect Peaches recipe. After you've cooked up your entrée, try these grilled peaches for dessert. Preheat grill to medium-high. Pour 1/4 cup Kraft Signature Raspberry Vinaigrette Dressing over 6 halved fresh ripe peaches in a medium bowl; toss to coat. Remove peaches from the dressing, reserving the dressing. Grill peaches 6 to 8 min. or until softened, turning occasionally and brushing with the reserved dressing. Garnish each with 1 Tbsp. thawed Cool Whip Light Topping and a mint leaf, if desired. Grill peaches as directed. Cut a purchased angel food or pound cake into thick slices. Place on greased rack of grill and cook until lightly browned on both sides. Cut peaches into slices, serve over cake slices topped with scoops of vanilla ice cream.